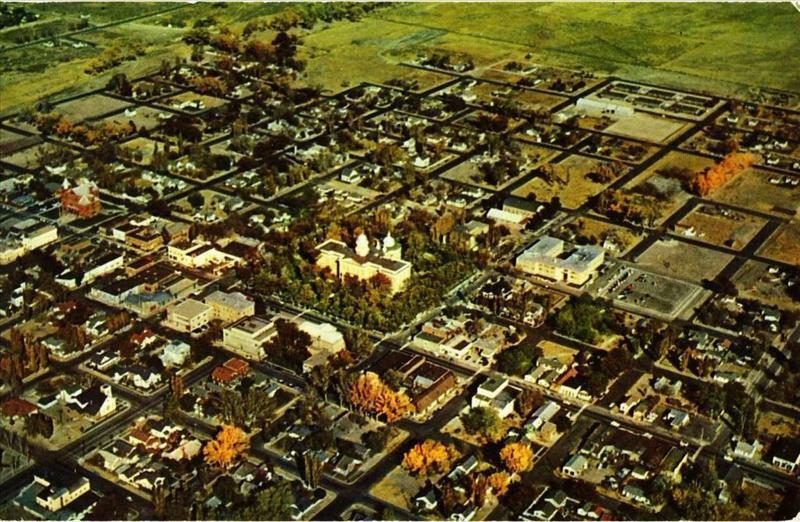 This view from high above Carson City shows most of downtown, with the Capitol Building at the center. There's much about this photo that has changed in the 40-50 years since it was taken. To the south (right) of the Capitol, the whole Capitol Plaza and Legislature Building have not been constructed yet. 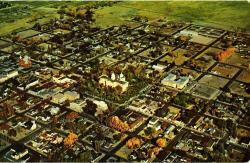 Instead there is still a sprawl of scattered houses and commercial buildings, along with the Nye state office building. The brick buildings right across 2nd Street from the Capitol date back to the 1860s, when Carson City was just a few years old. Looking out to the east of town, the last street is Harbin Ave, and beyond that is nothing but empty pasture. Also notice how none of the streets, like Roop and Stewart, go all the way north to connect with William Street (Hwy 50). That's because that empty area used to be the V&T Railroad yards. The tracks were torn up, but the land hadn't started to be developed yet.